Hello, Beautiful! 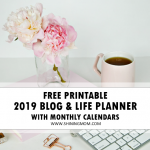 Looking for a monthly planner? I have here a breathtaking one that you can print for free! I guess this newest planner on the blog will become your instant favorite. I mean, look at those refreshing blooms! Won’t they inspire you to bring out the best in you this month? Keep scrolling to view this latest planner to plan out your most beautiful month yet! 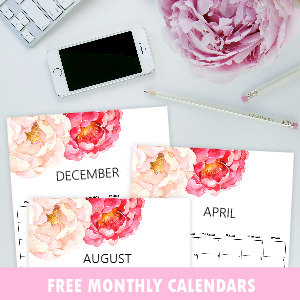 I am giddy in excitement to present to you this free printable monthly planner. Introducing… “Hello, Beautiful!” a gorgeous planner especially designed and created for all the women out there, for you! So friends, say “Hi” to this gorgeous planner designed to help you have a blissful month! Planner dividers with empowering bibles verses for women & more! Here, take a closer view at the planning pages. I hope that each page will immensely help you be more productive! Plan your every day in the most beautiful way! 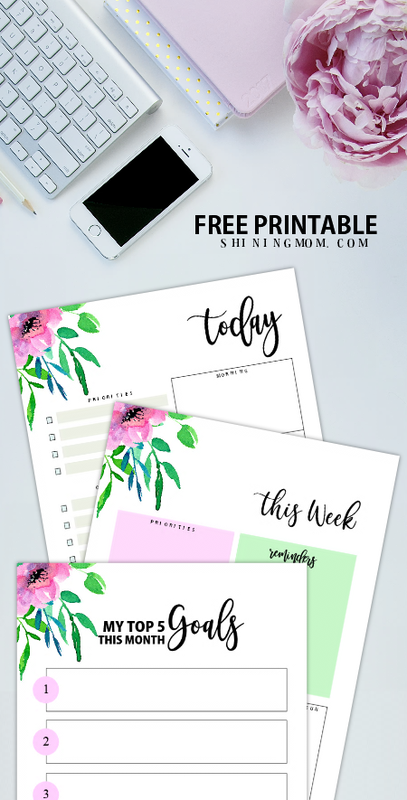 The daily and weekly planning pages I included comes truly dainty and clean with a practical and simple layout. Now you can plan all days of the week blissfully with your eyes on your goals. 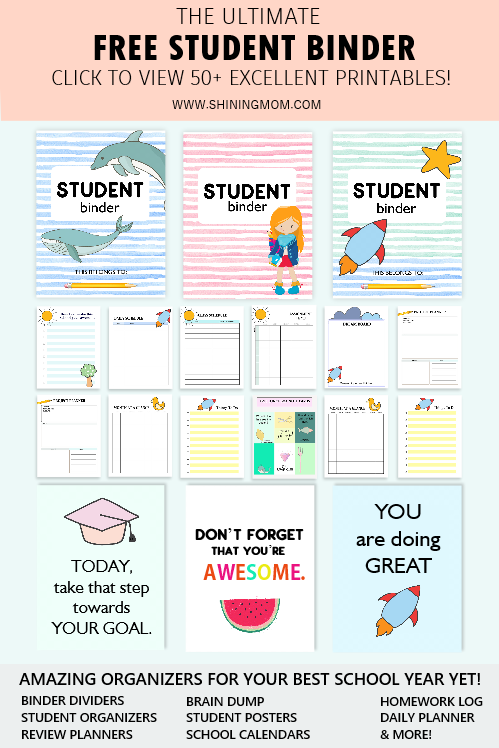 I am excited to use these printables, how about you? The cover pages is a stunner, what do you think? Those gorgeous florals swayed beautiful, isn’t it? This cover will certainly ring in so much positivity in your month! I also love how the colors of the flowers blended perfectly! A shout out to GraphicsDish for the floral elements I incorporated in creating this planner. Your work is amazing, dear! Well, how do you love the monthly planner so far? Am I right in saying that it’s a truly beautiful one? 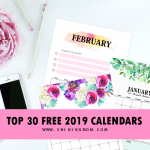 You can use this planner for all the months of the year because it’s not dated! I have also included dividers that you can use… which can also be displayed on your table! Ahhh… this bible verse has a sweet aroma that tingles through me. It makes me feel valued, cared for and loved. How my heart jumps in joy each time I remember that even the Father calls me beautiful! I picked this bible verse to include in your free monthly planner hoping that it will make you feel the same. We are beautiful! 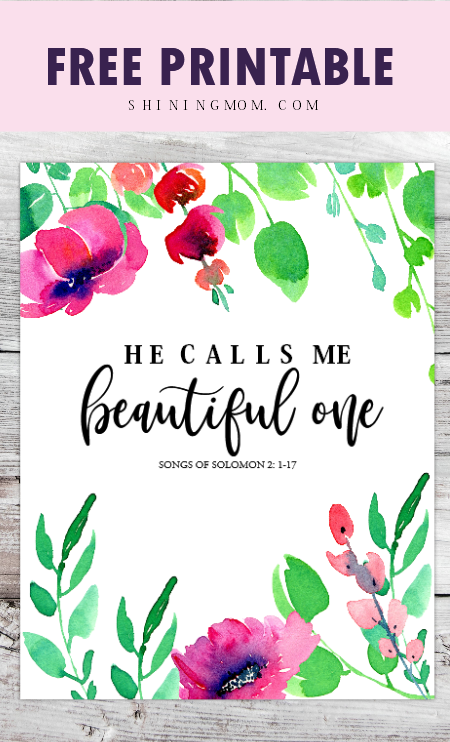 He calls us beautiful! Hello, there, beautiful! 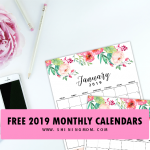 Ready to snag your free monthly planner? 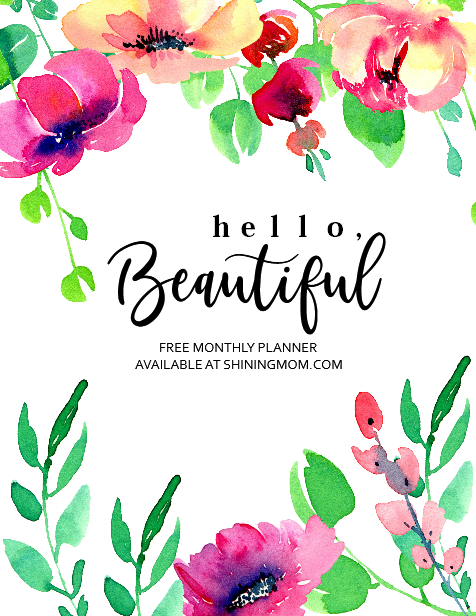 Do you think you can make the “Hello, Beautiful!” planner work to make your every month blissful, organized and productive? 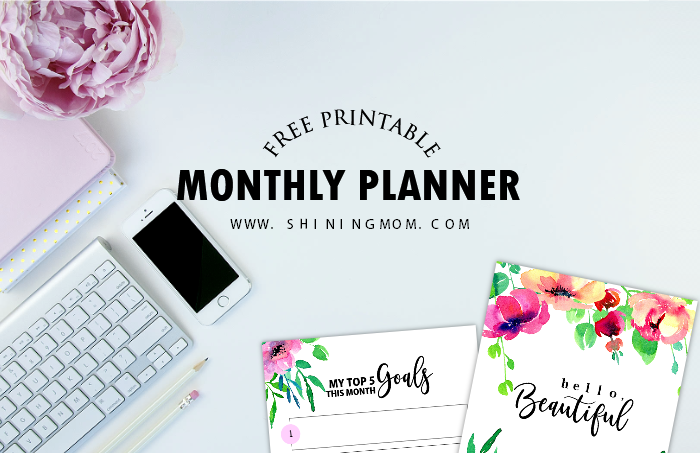 Go snag this free printable monthly planner HERE by quickly signing up to the Shining Mom mailing list. 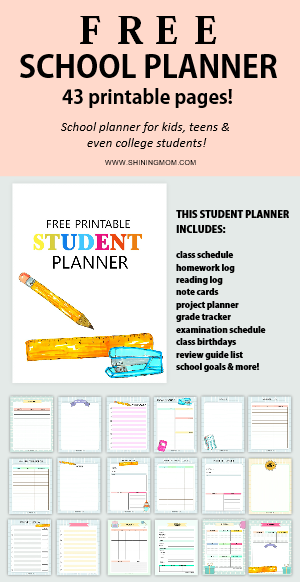 Your planner will be sent to your inbox right away! Monthly Planner Index: Grab These Beauties, Too! I have another good news, ladies! 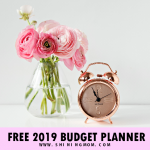 If you’re new here, please know that I do release a free planner each month. Yup, if you can expect a freshly deigned monthly planner from me if you visit here at the first week of ever new month! How great is that? Here’s a quick roundup of the past monthly planners that I have shared on the blog. You can also check them out! But hey! Do keep in mind that I will still be sharing new designs monthly so do come back for more! January Planner: Start an amazing year! February Planner: Sprinkle love in the air! March Planner:Plan your best March! 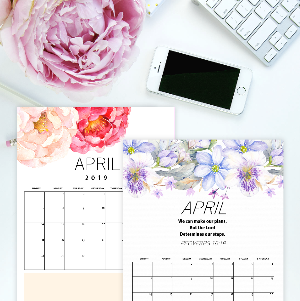 April Planner: Organize your month! May Planner: Have a blooming May! June Planner: Plan a beautiful June! July Planner: Make your month productive! August Planner: Aim for a productive August! September Planner: Plan an awesome month! October Planner: Map out your best month! November Planner: Target a bountiful month! December Planner: Plan a merry Christmas! Hop over to the posts to view the planners, Okay? Each monthly planner has a different design! 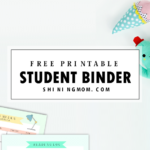 And oh, should you be looking for premium planners, you might want to check out the Back to Basics Binder! 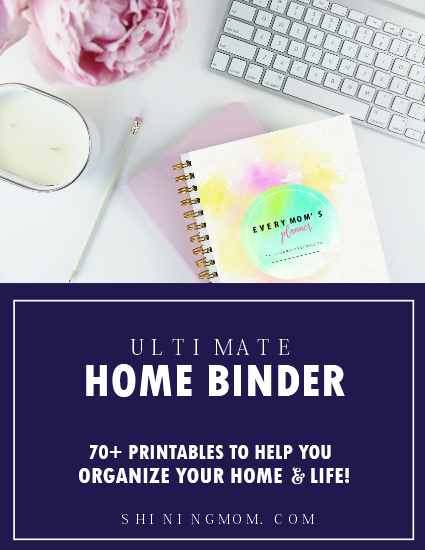 This nifty binder covers all the basic organizers you need to manage a blissful home and work life! I guess you’ll love it! 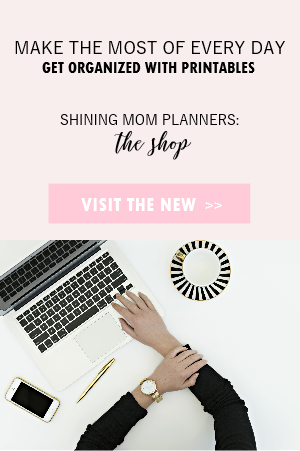 If you’re a momma, be sure to have my flagship planner,the Every Mom’s Planner. It’s my most-loved and most popular planner ever! One last thing, don’t forget to pin us on Pinterest so you can save this post for later! 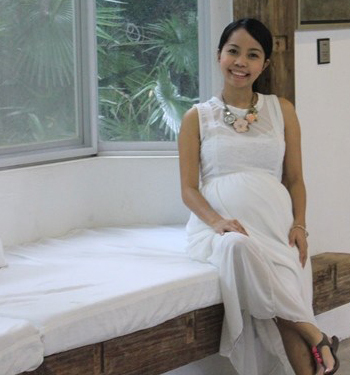 You’ll also help Shining Mom blog grow that way! Have an amazing day, beautiful! 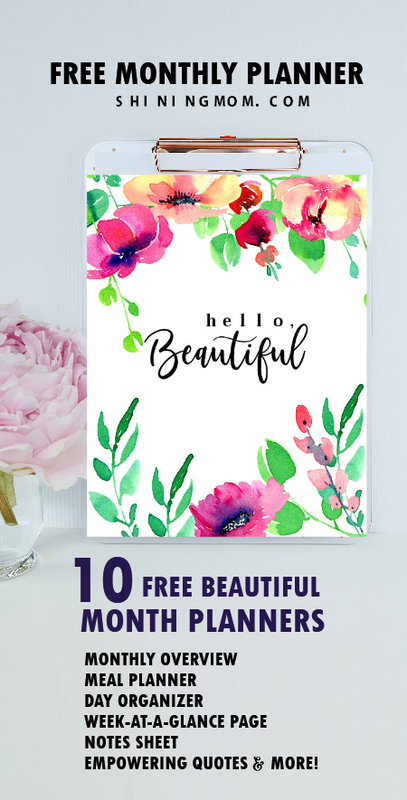 « Free Beautiful Printable Calendar for 2018! Wow! What an AMAZING planner!!! It’s so pretty, very well designed, and has EVERYTHING I need to run my homeschool teaching, meal prepping, mommying, traveling, business owning life! I’ve looked at soooo many planners over the years, and I finally found the PERFECT planner! THANK YOU!!!! Leslie! Thank you so much for your kind words. I really hope the planner can help you! Cheers to an amazing 2018! Wish I could download same day. Get email, and have to sign up each month! Must be a school filter thing! Love your work. Thanks, Niama. Wishing that the Shining Mom Planners will bless you, too.